Because Soviet Russia is awesome? Because Soviet Russia was awesome? took me a few times watching the video before I paid attention to him. She's still alive in my heart. Here is another tweet from JP Finlay I just stumbled upon while working on BHRBN. That moment when Randy Jordan realizes he needs to work on extending his contract with the skins. Hearing all of this about Guice actually kind of makes me mad we traded back from 44 in the first place. I mean yeah it worked out and we look like genius’. But I, along with many others, loved Guice and thought he belonged in the conversation at 13. And to see his hands and overall athleticism on display in some of those twitter videos, and to hear Trent talk about him in that manner has me damn near giddy. But yeah, if he lives up to his potential, I will be so thankful we didn’t mess up and trade down for more picks only to miss out on a superstar. Maybe we just got really lucky, about time some good things and positive vibes come our direction. As for the post above, Doug said there was disagreement in the draft room about the trade down with some wanting Guice. To piece the disagreements together. Round 1 -- some in the room wanted to draft someone else, an insider here said that was Jay and the player was Edmonds. Round 2 -- some in the room wanted to take Guice and stand pat. Round 6 -- Jay wanted to take Quinn. For round 2 and round 6 it worked out. As for the first rounder, it remains to be seen. The article below to me should be interesting for Guice. If I recall PFF has snacks as the top run defender or close enough for a DT -- that was one heck of a FA class for the Giants in 2016, he among them. 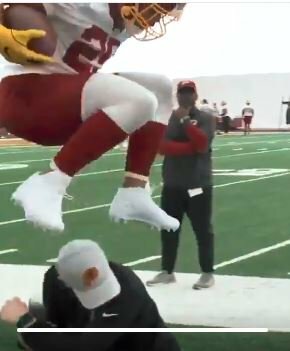 Watching Harrison versus our front on coaches tape and versus our backs -- he often handled them like rag dolls, so should be interesting to see the match up with Guice. Giants got a loaded D line now with Tomlinson emerging last year and McIntosh and Hill from the draft. “My response to that is I’m just happy that we are on the same team and he only gets to hit me maybe once or twice a year, rather than a full game,” Barkley said with a grin Wednesday after the Giants wrapped up their second of three minicamp sessions. In reference to the part in bold, I believe they had a pretty good idea that he would still be there. They would have looked at the teams picking between the picks and determined each teams needs and likely draft pick. If get it's still a risk but they clearly still had other players they liked and felt could make an impact at 59. This coming from someone who drafted him at 26 in the ES Mock Draft - We did this well before the bogus character issues were discussed. I trade back from 13 to get an additional 2nd rd pick. Below are the teams that picked between 44 and 59, who their RB is and my opinion on why they felt that team would not take RB before 59. Trying my best not to use hindsight - but the thought process during the draft. If you feel any of logic is flawed it could be a good discussion. Having said that, of all the teams in front of them at 59, IMO Indy was the only team that represented any real threat to take RB. And even they would already be giving up on last yrs 2nd rd pick. GB - RB - Ty Montgomery. Also, they have Aaron Rogers and a really bad D that cost them games last yr. Spending a 2nd pick on RB does not make much sense - yes I know they took CB in the 1st, but notice they took CB again in the 2nd. KC- Kareem Hunt - Enough said. AZ - David Johnson - With only 6 picks and more urgent needs - especially after taking Rosen in the 1st, Guice would have been a luxury pick - one they could not afford. LA C - Melvin Gordon - ranked 7th best RB in the NFL - RB was just not a need- certainly not in the 2nd rd. PH - Thay have a corral of RBs - Ajayi, Sproles, Smallwood - ANd they had just 5 picks - that 2nd being their 1st pick. No way they take Guice. Dallas - Elliott - No way they take a RB in the 2nd. I could see a late rd pick as some insurance in case Elliott does something stupid again or/and as a back-up. But like AZ, this would be a true luxury pick, one they cannot afford if they want to compete for PO spot. Also they need big help on D. I will go hindsight here - they took the best OG left on the board knowing they are about to pay some big money to their Oline (See Martin announcement) and will likely have to let one or two go. If was a great pick by them - as much as I hate to say it. But RB was never happening. CH - Jordan Howard - # 6 RB in the NFL. I can see a later pick but you are not using a 2nd rd pick for RB. They had bigger needs - WR for one which as it turns out is where they went. Indy - Maron Mack - Not going to scare anyone. However, they have Luck coming back and their game relies more heavily on him and the passing game. Also, Mack is a 2nd player that had an up and down season last year - 2nd in the league for 0 yd carries but also leading the league in carries over 20 yds. Having just invested a 4th rd pick last year, have luck come back this yr and more pressing needs, it was a good bet they would not go RB. Having said that, to this point this team presents the biggest risk. TB - They had already selected Ronald Jones at 38. Zero chance they go Guice. Cinn - Giovanni Bernard and Joe Mixon who they used a 2nd pick on last yr after some character issues - punching girls. I do not think he should be in the NFL, but it's not my call. From a football standpoint he did a pretty good job as a rookie. No chance they use a 2nd rd pick on RB again this yr.
Carolina - They just took Christian McCaffery in the 1st last yr. He did a great job for them. Also, Cam takes a lot RB snaps away. RB for them at this would be a wasted 2nd rd pick. NE - They took Sony Michel in the 1st at 31. Zero chance they go RB again in the 2nd at 56. Oak - Marshawn Lunch and they just brought on Doug Martin. I could see a mid to late rd pick investment, but with those two guys they are not going RB in the 2nd. Atl - Devonte Freeman and Tevin Coleman - Between the two they make a pretty good backfield. Could Atl have chosen to take Guice? I guess, but it seems unlikely given they have two backs already and they had other bigger needs. Again, I could see a mid to more likely a late rd flyer, but not in the 2nd. They definitely have an impressive DL against the run, but where will their pass rush come from? Harrison and Tomlison are purely run stuffers, and McIntosh/Hill aren't great pass rushers either. It's like they're still building their team to outmatch the Cowboys, even though the Eagles are the team to beat in the division. Now that they switched to the 3-4 and got rid of JPP, I'm not sure where their pressure will be coming from outside of Olivier Vernon, especially on the interior. It will be interesting to see if Vernon can handle having to generate a pass rush for this defense pretty much single-handedly throughout the season. I appreciate the effort you put into this, and I agree with a lot of it, but you seem to be ignoring the fact that a team could have easily traded up for Guice if they really wanted him. The Steelers, Broncos, and Jets all had good reasons to go try to go get their RB1 of the future. The Steelers and Bell will probably be parting ways after this year, and the Broncos and Jets don't have any RBs on their respective rosters that will be scaring any DCs around the league anytime soon. That's fair enough, but honestly I was just focusing on the people picking on purpose. There is really very little way to know if someone will trade up. Also, my point was never to say there was no risk. It was to say it was minimal, at least from where I was looking. Also, they clearly had other players in mind. So as long as they had say 3 guys they were willing to take there and had judged they would likely still be there at 59, that's how you judge your risk. If someone takes him fine. You take one of the other choices. Again, there is always risk. It's just how much and are you willing to take that risk. I think we just got insanely lucky with Guice falling to where he did. I don't think it was some incredibly calculated move with tons of analysis on the part of the Skins...it was a combination of luck that teams seemed to be buying into the BS character concern stuff and luck that other teams happened to have someone else or another position they wanted or needed a bit more while he was still there or didn't want to spend the capital to move up. I think that after this season there are going to be tons of teams that will be absolutely kicking themselves for passing on him while he was sitting there. I almost lost my **** when he was there for us in the 2nd and we traded out of the spot. I thought there was a 99% chance that he would be long gone by the time we picked. I was probably right. We just happened to get that 1% long shot. In regard to the conversation above about us not picking him at #44, we need to remember the drama related to Guice. Teams were terrified to take him and it wasn't until a couple of days later that it was a nothingburger (never used that term before and never want to use it again). At #44, it was still a risk, but after gaining another pick in the trade, we were playing with house money and it was then worth it at #59. Doug Farrar yesterday on 106.7. Guice is a special player. Guice falling that far in the draft will be seen as the biggest mistake of the 2018 draft. He thinks Guice and Barkley are a toss up as to who is better. When you consider that we got Allen after he fell to us last year and Guice falling to us this year - we've really been fortunate two years in a row. Maybe we just got really lucky, about time some good things and positive vibes come our direction. I feel this way as well. I also think "votes" and suitcases of cash pass hands during the NFL draft. Just because Kevin Garnett and the Timberwolves got caught doesn't mean the contraband stopped flowing. I for one have no problem with it. I just see RBs as easier to predict, if you have the instincts and the skills you will usually succeed. Sure there have been some high pick RBs who busted, but not nearly at the rate of 1st round DL busts. I was absolutely dumbfounded when so many other RBs were taken ahead of him. Teams must have REALLY been scared of those character reports because IMO there's no way you can watch his film (especially when he was healthy in 2016) and conclude that all those other backs were better runners. As far as Barkley and Guice, it's really hard to compare because they're such different runners and played in such different systems in college. Obviously I've been a fan of Guice for a while so I'm probably at least a little biased but IMO he's more of an "NFL" ready back than Barkley and a better pure runner. Barkley makes absolutely jaw dropping plays sometimes, especially in space, but he also has lots of negative plays, isn't all that great between the tackles, and isn't all that physical for a guy his size. He's one hell of a weapon though, if you use him correctly. I can see a bit of the Bush comparison that someone made earlier in the thread. Also, I'm just so sick of the goddamn hype around the dude. We got lucky, if we graded him that highly, we wouldn't have traded the opportunity to draft him away. We moved back a considerable amount, but Minny gets credit for Diggs after passing on him several times, NE passed on Brady several times, every team needs a little luck to go with their hard work. I think people will be saying the same of Payne. He will be a top 5 player from this draft, imo. I believe he will have a more impactful career than Chubb. This is certainly possible, but the reason I brought up Allen and Guice in the same sentence was that both were projected way higher than where we took them. Arguably, Payne was taking where he should have been, maybe even a little earlier based on the projections. None of that matters, the picks you dont have are available to everyone in the nfl, we controlled one pick & we traded down. Detroit moved ahead of us to take a RB, perhaps thats the player we wanted to take. We didn't think Guice was worth taking where we were. Absolutely, I manipulated your point a bit to share some Payne enthusiasm. I should be ashamed, but Im too excited about football to feel bad about it. Guice will be better than Barkley. Love that the hype is starting to build on this kid and people are seeing his ability even if it’s just practice/camp. I keep saying it but he will be a future All-Pro and will win the rushing title at some point in his career. Being the only RB in SEC history to have 3 250 yard games and 2nd in SEC history in YPC behind only Bo Jackson, all while playing 2nd fiddle to Fournette in 2015 and some of 2016 and playing an absurd amount of snaps against stacked boxes in 2017 (while nursing a nagging knee issue) is really friggin impressive.